The story of the successful partnership between Infomir and StarNet. A detailed description, figures, and the results of our collaboration. The history of Infomir and StarNet cooperation. Learn how in five years of successful collaboration with Infomir, the telecommunications operator StarNet has become one of the largest IPTV providers in Moldova. 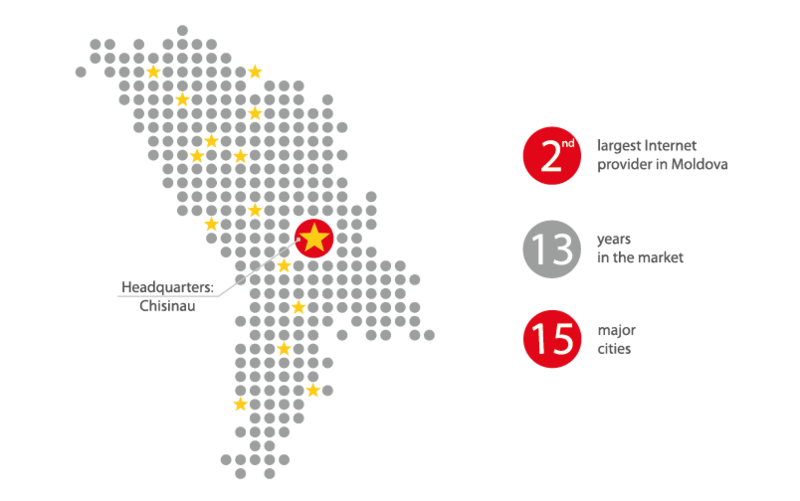 StarNet is one of the largest telecommunication companies in Moldova. They provide a wide range of the services needed in every house and office: high-speed internet, fixed NGN telephony, digital TV, hosting, virtual private networks, hardware installation services, etc. The company was the first to create a fiber-optic network (Fiber Link) in Moldova. In October 2011 StarNet launched the largest free Wi-Fi network in Chisinau, the Moldovan capital, which now is over 90 km long. In association with city authorities, they provide free internet access to most of the local schools. The telecom company has won the «Gold Mercury» award three times. This is the highest national award in the field of trade mark recognition in Moldova. We can state with full assurance that we are worthy of the “Made in Moldova” label. We are 100% local investment, being created on 7th August 2013 by a few enthusiasts willing to change the Republic of Moldova. Simplifying the access to communication technologies and next generation solutions was our way to do that. On 14th February 2011 StarNet launched an IPTV service based on their fiber-optic networks. In June 2012 they received a first shipment of Infomir set-top boxes. Since then, MAG250 has been the only client device for watching interactive television from StarNet. StarNet and Infomir share the same goal: to make modern technologies generally available. Willingness to provide only the best services and a customer-oriented approach are among the major values of StarNet. In this project they were looking for suppliers with the same perspectives and ideas. However, to see eye to eye on the issue is not enough for a long-term partnership. The equipment supplied should fully meet customers’ requirements. Why Has StarNet Chosen MAG? The complete production cycle allows Infomir to track the quality of devices at each manufacturing stage. The Middleware was developed specially for MAG set-top boxes. So they work much better than analogs with the same properties but using third parties’ software. StarNet aims to provide the services that meet modern market requirements. A trial batch showed high-performance when playing FullHD content. The software allowed implementing many features popular among users, such as TimeShift, EPG, third parties’ apps, etc. An opportunity to alter the functionality and interface became another benefit for StarNet. The company’s developers have readjusted the interface to match the company style and to make it more convenient for the local audience. Timeshift – a user can pause or rewind his favorite show. Our personal fiber-optic network helped to create a modern interactive TV service. Jointly with client equipment from Infomir, it ensured a rapid growth of service popularity. Within five years of cooperation, more than 90,000 set-top boxes were sold. StarNet is now one of the largest IPTV providers in Moldova.